Enzo Life Sciences is an established leader within the epigenetics market, providing pioneering Fluor de Lys™ kits for detection of histone modifications. As the field of epigenetics expands, Enzo Life Sciences is poised to maintain this leadership position by meeting the growing demand for more efficient and sensitive assay platforms for DNA methylation analysis, including conversion and detection kits. DNA methylation is one of the most studied epigenetic modifications, both in terms of basic biology and biomarker discovery. It can alter gene expression, cell differentiation, and often results in unidirectional changes to genomic DNA. As DNA methylation is involved in so many cellular processes, errors resulting in abnormal patterns can lead to disease. Enzo’s high-efficiency BioArray™ conversion kits for detection of 5-mC and 5-hmC modifications (Express DNA Methylation Kit, Blood & Tissue DNA Methylation Kit, and BioArray™ 5-hmC Methylation Kit) allow for resolution of single-nucleotide changes without the introduction of DNA damage. Unique features such as capacity for multiple sample inputs, rapid processing time, and high conversion efficiency rate, provide enhanced flexibility without sacrificing performance. For researchers requiring downstream analysis products, new ELISA-based detection kits for 5-mC and 5-hmC exhibit high specificity comparable to mass spectrometry analysis and are amenable to high-throughput processing. Complementing the ELISA kits is a new qPCR-based detection platform, the BioPanel™ DNA Methylation Detection Kit for Human Pluripotent Stem Cells. This product is designed to quantify the percentage of DNA methylation in 6 gene promoters, including RAB25, NANOG, PTPN6, MGMT, GBP3 and LYST. With rapid analysis and minimal handling steps, researchers can quickly and reproducibly monitor stem cells for methylation changes that may impact the differentiation state of the cell line. With this expanded offering of epigenetics products, Enzo Life Sciences enables scientists to achieve complete analysis of DNA methylation events. These products along with our HDAC and Sirtuin screening assays, Screen-Well® Epigenetics Library and numerous antibodies and active enzymes combine to provide a total solution for epigenetics-related research needs. 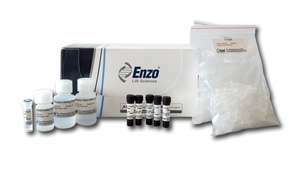 For more information on, or to order these and other epigenetics products from Enzo Life Sciences, please visit us at www.enzolifesciences.com or call 1-800-942-0430.